Because there is nothing else like it. Our Matrix NEO! is one of the fastest, most flexible and up-to-date mobile POS cash register systems for iOS and Android. More than 20 years of experience in developing POS cash register systems, an unbridled interest and an instinct for trends in the hotel and restaurant trade have been put into our POS cash register app. We have managed to develop one of the most efficient and most straightforward systems for iOS and Android tablets and smartphones on the market by simplifying the most important components and using the latest technology. Our cash register scores highly with its intuitive and modern design combined with an established reporting function and a variety of interfaces. NEO! will win you over because it is passionate about the restaurant trade. We know what restaurant owners expect of a cash register system. Matrix NEO! was developed for restaurant owners who value modern technology combined with experience and security. Our Matrix NEO! POS cash register system is available for iOS, Android smartphones and tablets. Basic functions such as taking orders, splitting payments, printing and the fact that EC card payments & credit card payments can be taken directly at the table – these all go without saying for the Matrix NEO!. The NEO! can switch between Wi-Fi and a mobile data network without the waiting staff even noticing, which is a new feature in the POS cash register market. This means that nothing else can go wrong – even in your business outdoors on the terrace! The unique NEO! design offers a much longer battery life than traditional POS cash register systems for tablets. In this way we can ensure that your service will operate smoothly. As a restaurant owner, you don’t need to make any compromises with Matrix NEO!. 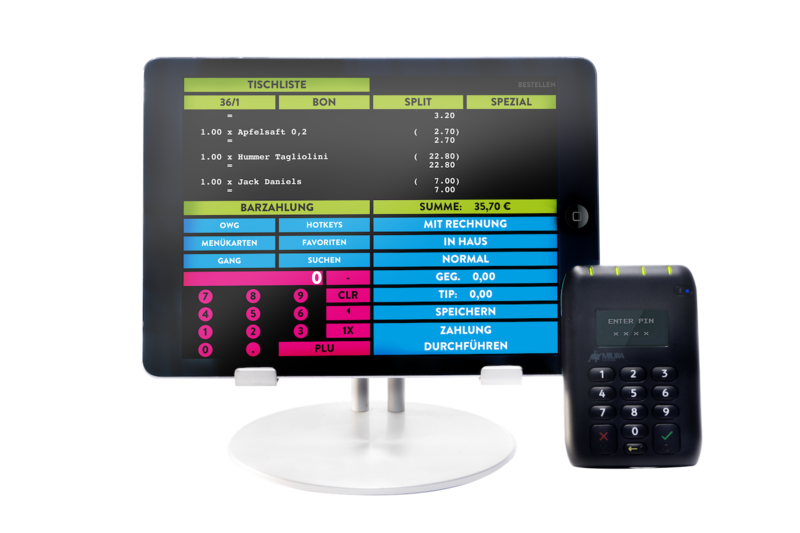 This is a modern, intuitive and user-friendly design combined with all the performance and functionalities of a POS cash register system, when they are needed. Don’t restrict yourself – plan ahead: Matrix NEO! knows no limits! these clients work successfully with Matrix NEO! Matrix NEO! speaks for itself! We believe that gaining new customers is the best form of recommendation – lots of our customers have already found out about our innovative cash register app because of recommendations. These customers have chosen to use Matrix NEO! If you want to talk about Matrix NEO! with a colleague, we are happy to set up a contact for you. You can talk on equal terms – after all, restaurant owners know exactly what an efficient POS cash register system needs to be able to deliver. The mobile feature is really useful! With its speed and flexibility, the NEO! really scores highly when it is busy. As restaurant owner, this form of independence will really increase your turnover. Your waiting staff will able to offer your guests a faster service and there will be a higher turnover for your tables. The mobile function offered by the cash register app means that your team will have more time for your guests as a lot of the walking has been cut out. Your guests will be pleased with the efficient service and the smooth operation. So there are a lot of arguments for using the Matrix NEO! in your business too! Less stress and a higher turnover for little cost! We are setting new standards in flexibility for cash register apps. The Matrix NEO! does not just work with iPhones, iPads, Android tablets or smartphones. Our POS cash register system also has numerous interfaces for other systems – you might even already be using some of them. When requested, Matrix NEO! can exchange information with your favorite systems – and it is all safe and reliable. Of course, data is exchanged in compliance with all the principles of data security and the latest guidelines. Data security and mobility are becoming more and more important in our society. You can use the Matrix NEO! for the mobile processing of credit cards & EC cards securely and right at the table. In this way it is guaranteed that guests never have to hand over their cards and you will be complying with PCI guidelines. Your smartphone or tablet will be directly linked to the credit card reader via Bluetooth to enable the mobile payment function. The guests enter their pin code and Matrix NEO! prints out their receipt on the spot. This can be via a belt printer or at the nearest service area, for example. Payment can be that easy. MATRIX NEO! is a total winner, and you will see that in your turnover. For a start, the extensive reporting function offered by our Matrix NEO! POS cash register app will help you by giving you a full overview of your figures. More than that though – NEO! is a POS cash register system that can be fully utilized and will help you to increase your turnover due to its intuitive design, diverse interfaces, portability and because it is easy to use. There is no more need for lengthy staff training. The POS in your hand – always close to your guest. Matrix NEO! can do so much. As an experienced restaurant owner, you know what a POS cash register system can do. We will surpass any expectations you have of a tablet cash register system – we are certain of it! NEO! is one of only a few POS cash register apps and you can use it to accept EC card and credit card payments right at the table. 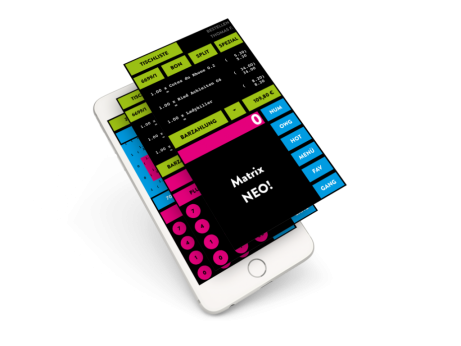 And by the way: Support and updates for Matrix NEO! are already included in the monthly license fee.